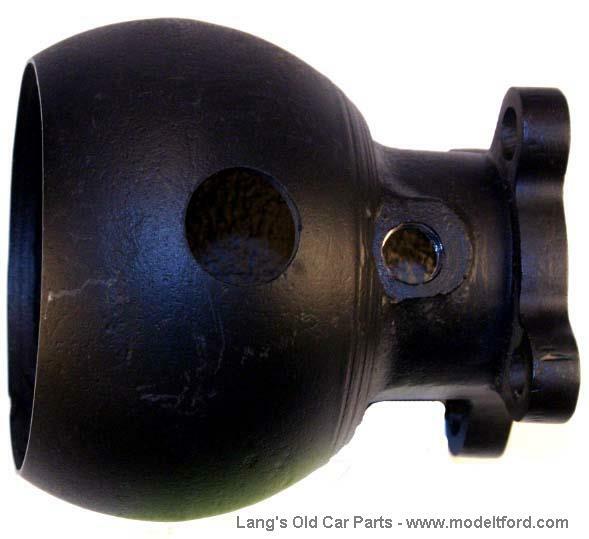 Ball end, (Universal Joint housing) for two-piece drive shaft housing. A core from a later housing is re-made into a style that can be used for the earlier style universal joint. Part number 2582FC, the End to Convert later Drive shaft to 2-piece style, bolts to this Ball End. NOTE: Requires the front casting from a later one piece drive shaft housing as a core. REFUNDABLE CORE CHARGE: A U-joint housing (front casting) from a later one piece drive shaft for an EXCHANGE CORE REQUIRED or this REFUNDABLE CORE CHARGE WILL BE ADDED TO THE COST OF THIS PART. We will pay $10.00 for extra rebuildable housings.